Well I was going to prattle on about the highlight of my day being the large flocks of Fieldfare flying over the biggest of which being about 300 birds near Maxstoke - but you dont want to know that. No, you want to test your Gull identification skills. So have a look at this. I'd assumed it was a juvenile Lesser Black backed Gull but I'm not 100%. Bill looks long, head looks small. I dont know. The photo was taken at Shustoke reservoir this morning. 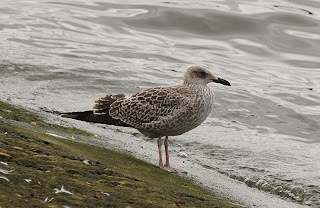 I'm "Gull blind" so you can rule out my go - Juvenile Great black backed Gull?